Sure, it might be named PMS, but this little speaker will definitely put you in a good mood! If you've ever tried to listen to music, movies or play your favorite games on your laptop or smartphone, you've surely noticed the sound quality to be a bit lacking. Luckily, the Sonar Portable Mini Speaker (PMS) provides shockingly powerful, clear and loud sound in a tiny capsule that fits conveniently into your pocket. Utilizing patented vacuum bass technology, the unit pops open to create rich, full sound when connected to virtually any media device. Simply collapse it when you're done and take it with you wherever you go. 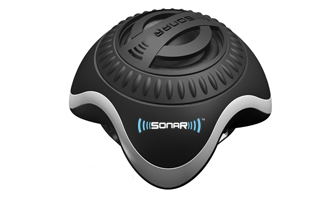 Whether you just want to upgrade the sound on your laptop without big desktop speakers or you need great sound on the go when you're traveling or just lounging by the pool, the Sonar PMS will be your solution. Comes with a built-in connector and rechargeable lithium battery that lasts for hours along with a convenient carrying pouch and simple USB charging extension cable. Package 4.75" x 6" x 2.5"
Xoxide Zach says - You won't believe how much sound comes out of this little Sonar portable mini speaker unit! I have one that I take out on my back patio and it sounds loud and clear throughout my entire backyard.